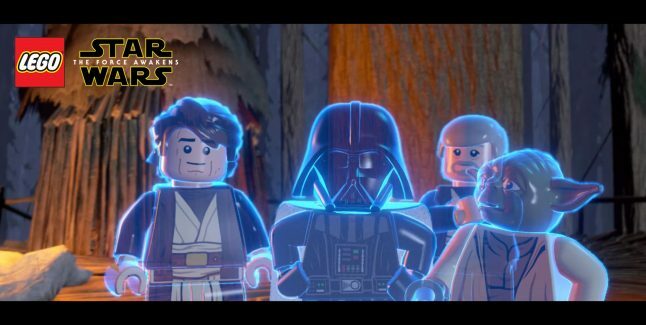 Easter eggs have been confirmed for Lego Star Wars: The Force Awakens. Watch footage of them all below. You can see 5 force ghosts fight for Luke Skywalker’s attention at the end of the Prologue: The Battle of Endor! That’s at past 10 minutes into the below cutscene video. So far no way has been found to make these force ghosts playable characters in-game. At 0:47 seconds into the Ending credits cutscene you can see Poe and Admiral Ackbar play this very Lego Star Wars: The Force Awakens inside the Lego Star Wars: The Force Awakens! How meta*! Here’s a funny Indiana Jones reference at 2:04 minutes into the trailer. Harrison Ford who plays Han Solo in Star Wars movies, also plays Indiana Jones in those movies, where he always says to “never bring a sword to a gunfight”. In that typical Indy fashion Han shoots the Stormtrooper with the swords from afar instead of fighting him! This hidden location on D’Qar in the “Poe To The Rescue” Adventure Level is a fun little secret, Kylo Ren’s bedroom. Discoveries made by Disney, TrueCutScenes & Random Chievos. Have you found any Lego Star Wars: The Force Awakens easter eggs?